Yesterday was the second day in a row where we did 5 batches of soap. We really thought we'd be set for a while longer, considering all we had for the Farm Show, but this is GOOD! Bob helped Maryanne get the cutter wires all snug, so each bar looks perfect! But I snuck out in the morning, yesterday. The woods were calling. There is so much to be done outside, but the garden got *mostly* planted on Saturday, the mowing was still to be done in the afternoon, and the woods were full of the violets I wanted for a tincture. The first thing I noticed was the pathway down through the woods. It has been neatly mowed, which makes it so easy to get in there. Last night Bob and Maryanne went along down, and it was noted (YAY!!!) that another path that goes to the creek would be needed. The pond is filled with golden orange fishies. The frogs and tadpoles are noisy, and the turtles float lazily on the surface. Further into the woods, I found the spot where we planted the trilliums and the wild ginger last year. All of the trilliums have come up, and almost all of them have additional sprouts. The wild ginger is getting pretty big, despite the fact that there is an animal in the woods who just loves the ginger, and nibbles it to the ground. I was relieved, thinking that perhaps it had been killed. All of the Bloodroot that covered the hills last week is now gone. I'm glad I got out there to see it. The spring flowers come and go so quickly. This week it was polluted with spring beauties and trout lilies. The chickweed is lush and green. The jewelweed is up a couple of inches, putting out the second set of leaves. We found the Dutchmen's Breeches that we planted last year! It has spread all over the little area where we put a few plants. I was VERY excited to see that. The bluebells don't appear to have made it, but we'll get more and put them in a place that we can keep an eye on them. I think the deer ate them last year. Something dragged them out of the ground, and although we replanted them, it looks like they didn't "take". And as if that all isn't good enough, this morning there was a rainbow right outside the back door. Within moments of waking, there was rain and I noticed the sun. I thought, "where is the rainbow, then?" and looked out to see one! Ok, so there's no thyme in the salves, but I just couldn't resist using that spelling. During the last week we did the on-line salves and balms class. It was lots of fun (especially since Maryanne helped out with a lot of the questions), and it seems like everyone got to try out some ingredients they didn't "know" before - that's always the most fun for me. I did some research into old recipes. There were several on the web, including one that has bloodroot which claims it will draw tumors right out of the skin. Don't know about that. It's fun reading the old recipes and trying to figure out what they meant by some of the different measures and even what they called some of the ingredients. Melt in gentle heat and sir vigorously. Preserve in covered jars for use. Melt these ingredients in a double boiler and pour in molds of proper size and form. Equal parts of white mutton tallow, unsalted butter, beeswax and stoned raisins. Simmer until the raisins are dried up but not burned. Strain into molds to cool. This preparation smarts chapped hands, but quickly heals them. Put in a glass fruit jar 4 ounces of fresh suet, 6 ounces of olive oil, 1 1/2 ounces of powdered gum benzoin, and 1/2 ounce of alkanet root. Place the jar in a double boiler and simmer with gentle heat for several hours. Let stand 24 hours more; heat, and strain through cheese cloth, and when cold perfume with 1/2 dram of essence of ambergris, 1/2 dram of oil of lavender or any other essential oil preferred. To 10 grains of camphor add 2 ounces of prepared lard and 1 fluid dram of rectified spirits of wine. Apply a little of the ointment at night, previously washing the face, and strengthen the body by means of tonics and nourishing diet. Or bathe the parts where the wrinkles appear with alum and water. This will tighten the skin. Or fresh butter, 2 drams; essence of turpentine, 2 drams; mastic, 1 dram. Wikipedia says: "Spermaceti is a wax present in the head cavities of the Sperm Whale and in the blubber of all whales. ....brilliant white crystals that are hard but oily to the touch.... devoid of taste or smell. " This ingredient is no longer available or used. Jojoba esters, a solid wax (as compared to jojoba oil which is liquid) is a botanical alternative. Spermaceti has gone the way of civet musk. Animal products are no longer available for purchase or use - at least to hobbyists. I don't think they are for industry, either. Last year there was a story about a couple who'd found a giant gob of ambergris on the beach (whale vomitus). Ambergris was once a cherished ingredient in perfumery. The most interesting thing is that every time I teach something, I learn more. Researching for pearls that will be memorable leads me all over the place - internet, books, magazines, and emails to friends who might know. Every speaker, class, or workshop I've ever attended has *something*. There have been some dismal disappointments, where I've expected to learn a lot, and find that it is a typical "101" type class (after paying for the more advanced class, IMHO). Even so, there is ALWAYS some little pearl of wisdom that comes from each class. One class, that meant learning that I knew way more than the teacher, and therefore might want to start teaching it myself :-). Visiting Lancaster County? EAT HERE! I've very proud of the this part of the country. Our region is the garden spot of America, with beautiful ( though vanishing) farms, exceptional craftspeople, a work ethic that draws employers like bees to honey, and... ok... great food. I've lived here all my life, and it is "my" country. When tourists come to the area, they are drawn to the neon. They go out to the big places that were built especially for them. Dutch Wonderland hasn't seen a real PA Dutchman since they worked to build the place. Places like Good 'n Plenty, Plain & Fancy, and Kitchen Kettle Village are ok - but they were created for tourists. There isn't much authentic about them. Today we happened upon a great place to eat if you want to get a taste of Lancaster County. The Home Place Family Restaurant, right beside the Achenbach Bakery... sort of like food heaven. 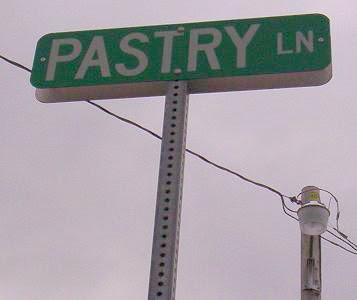 As we turned into PASTRY LANE (what on earth could be better? ), off of Route 23 above Leola in Bareville, we caught a whiff of a scent we'd not smelled since childhood. The diners of our youth were always surrounded by the smell of donuts and baked goods. Achenbach's bakery is well known for their excellent products, and the smell had us nearly floating in the door. Our waitress was really very wonderful. The first sip of coffee reminded us both simultaneously of the coffee we'd made in our rooms in Bermuda - delicious. It didn't hurt that we would then hang out together in the early morning, drinking coffee and planning the days' activities. Anyway, it was a friendly place - the waitress joked around with us and asked if we were related to one of the Martin girls, a guy at the counter joined the conversation and there was lots of laughter. The bacon was superb. The atmosphere was extremely welcoming, and it was clean without being antiseptic. The food was great - as most breakfast food is anyway. Maryanne had fried potatoes and said said they were "real" and delicious. I know full plates would have been better - but we just dove in without thinking. It's all about the atmosphere, folks. If you come to town to experience what life is like here, check this place out. You won't be sorry. It is no accident that Earth Day coincides with the Vernal Equinox. It is also the same time each year as Arbor Day. These are all moments that stir each of us - for whatever of these reasons or named days - to stop and appreciate Nature and the planet Earth. I am old enough to remember the first Earth Day in 1970. Being in high school at the time, the new words being used were "ecology" and "environmentalism". They were scary, because they spoke of the disasters that could befall humanity if we did not take care of our home. In the previous decade DDT had been removed from use. We'd seen the decimation of many species of wildlife, and the book "Silent Spring" by Rachel Carson had come out. Being in farm country, there were many mixed messages assailing my young mind, but I could see what was happening - even then. That was when disposable lighters came out. Disposable shavers. Disposable diapers. Even the spoons that came with ice cream cups (the cups were waxed paper) were originally made of wood. Up until then, most bottles were glass, and returnable. Suddenly plastic was everywhere, and it truly was changing life. In our giddyness, we allowed ourselves to be foolish. Even then, people started to warn us. We didn't want to hear. We loved our new life. In 1969, there was a huge oil spill. Gaylord Nelson, Governor of Wisconsin gazed upon it and decided it was time that we stop. He was the founder of Earth Day 1970. There were already many peaceful protests being carried out against the Viet Nam war, and this was modeled after those. The symbolism of balance from the equinox was also a part, and peace played a part in the first Earth Day theme. Even that first year, there were significant legislative changes made, focusing on the Clean Air Act. Legislation like the Endangered Species Act, Clean Water Act, and all legislation protecting wilderness, wetlands, prairies, oceans, or species is due in large part to Earth Day. We have to do what we can. Reduce/Reuse/Recycle. My first "real" boyfriend had a button on his denim jacket. It said, "If you're not part of the solution, you're part of the problem." I was never fond of the delivery, but the statement becomes truer every day. This is your home - clean it up! Each year, we become more and more fascinated with the baby animals around here. This year, the horse farm up the road had 2 colts so far, and there was on very uncomfortable mare that we haven't seen for a few days. Both of the colts are pale, although the other one is more buff colored. The willow tree in the background is so golden. They are common in the meadows here, and I love the color of the first growth each spring. There is a cattle farm that I pass each day on the way to pick up Molly from school, and the pasture is dotted with the tiny calves. I don't know why, but baby cows are so sweet looking. Give them a month and they become cows, and have lost that cuteness. Last year I remember passing by moments after one of the babies was born. I called out the window, "welcome to the world! ", and spent a few minutes thinking about how it felt when my child was born. The world stopped for a second so that she could get here, and everything changed in that second. I wondered how mothers of other species feel. Laying in that pasture, the two of them looked so startled, seeing each other and wondering what had happened. It was also the first day to really get into the woods. Very wet, with water running down the path. That made Crocs iffy shoes to wear. I knew my feet would get wet, but no sense inviting the water in. Also, later when I jumped onto a dry spot in the middle of the creek, a piece of barbed wire went into the sole. I kept thinking there was a pebble in the shoe. Thank goodness I figured it out before stepping on something hard and driving it through my foot. So... to recap, Crocs aren't good in the woods. All of the Trilliums have come back and most of them have multiplied! Very exciting to me! The one here is surrounded by chickweed and dried leaves. Trillium has also been known as "bethroot" , and "birthwort", the root having been used for female complaints from adolescence through menopause. This plant is not common in our area, so I would never harvest it for medicinal use when there are other things more commonly used with good results. Black cohosh is much more common, and easy to grow. Bloodroot (Sanguinaria canadensis) is popping up from underground and sending out the beautiful snow-white flowers and unusually shaped bluish-green leaves. I wonder if the roots would yield a good dye. The plant itself is poisonous. These plants foretell of the Mayapple, Dropwort, Spring Beauty, Cranesbill, Hepatica, Bluebells, Dutchman's Breeches, Wild Ginger, False Solomen's Seal, Violets, Trout Lilies, and Daylilies to come. Another fabulous issue is starting to reach subscribers! I wrote earlier about Deborah Stiffler winning the cover contest, and this is how it turned out on a peach colored paper. We really need to get a handle on adding pages. I'm still trying to figure that out. It was fun getting input from readers on the cover. The cover is one of the things that was SO difficult during the early years. Back then, I didn't have a digital camera, so the covers were cut and pasted from all sorts of things. Many times I used real plants, and once the cover involved ground coffee for a particular "look". These would then be laid right onto the glass of a copier, and then different effects could be applied there. Once, I used dried Queen Anne's Lace on black paper, and reversed the image so that the plant was black. Oh well... a little walk down memory lane. ….. For love of a series of books, a garden is born. ….. How to choose the right product for your needs. …..Great ideas for getting the kids dirty! ….what is this mysterious beverage? …..How did they get here? Make them go away! 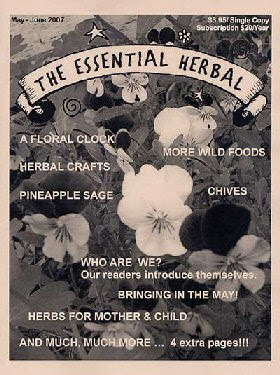 …..Ever wonder who reads The Essential Herbal? Read on. …..The story of how they began. …..Not the stuff you buy at the corner bath and body store! Herb Dispatch, Cindy Jones, PhD. Yesterday was the second day of the PA Herb Festival, and we were there. Maureen Rogers (Herbnet) could only be there for the first day, so we set up, and covered her booth the second day. This festival kicks off the season in our part of the world. 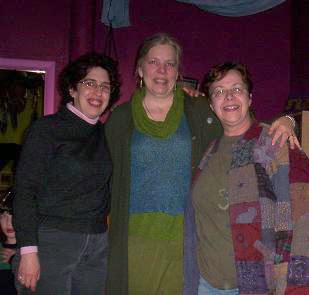 It was so much fun to see old herb friends again! Over the fall and winter, we may speak on the phone or via email, but there's just nothing like the burst of seeing everyone together doing what they love. 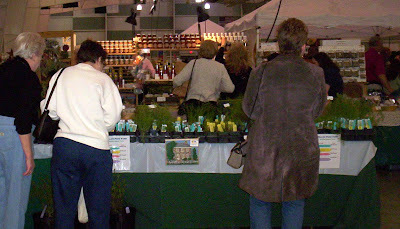 The crowd was enthusiastic and friendly, and even though the weather is not cooperating for the growers, people were buying plants - and everything else. This year I notice a lot of herb blends and dip mixes. There were several semi-local wineries represented, and although we were hesitant to take along soap because of the number of soapers there, most of them were glycerine based melt and pour - so ours stood out. I wish I had taken more pictures! I saw a really great calendar for Planting by the Moon, from Sue of Sue's Salves (link and info to come). She did all the photography and set-up, and it looks great! Every day has something to do or think about. There was a guy who had beautifully decorated gourds, and an old ren faire friend was there with her Gypsy Garden shop. TONS of great garden art. There was a wonderful mix of products, and we pigged out on baklava made with blueberries and raspberries. Jason Spring of Spring Thyme Herbs showed me pictures of his new (11 months) baby girl Leah. She is a doll - looks like Mom, Silke, and is lending a new challenge to their family business. I'm not sure how they snuck her in during the year... His plants look great, and we had a discussion on chamomile tincture. His mother is always there helping, but I could tell he missed having his wife by his side. Some people I only get to see at this show in York. Roxane Kain has worked on the festival from the first year, and after years of doing mountains of paperwork and correspondence, now handles the announcements. I love to watch her bop around covering for speakers and giving vendors breaks. Pat Myers is a Master Gardener that I met a few years ago, and she gets a lot accomplished, getting the show together. There are some really neat people involved. Lots of volunteers. Some of the organizers I don't know. As always, it's fun to see the Repperts - Susanna and Nancy, and Barb Steele from Alloway. More than anything, I enjoyed meeting subscribers. Several made a point of coming to the booth and introducing themselves this year. That was great! Another rewarding point was selling several of the wild foods cookbooks. There is a definate upswing in interest in the subject, and that's exciting. People are starting to see the value in finding the food growing all around them. All-in-all, it was a pretty good show. I'm looking forward to the ones to follow! Things have been moving right along around here, but you wouldn't know it from reading here. It's very convenient to use this space to explain all about the classes, but then I need to keep them at the top until sign up is over. Anyway. Sign-up for kits is over. They are sold out. Classes will continue to sell until the day before the class. Ok, so.... Geri Burgert and her family came to visit the area last week. Geri is the "Suburban Herbie" columnist in The Essential Herbal magazine and has been contributing regularly for a couple of years. It is hard for me to believe that we'd never actually met because it just *felt* like we knew each other for years. Her family had visited the year before (living in a tourist area does have many perks), but the kids were very young and needed all of her attention. They are still little, but she did get to finish a sentence or two. The first day, Molly and I met the family at Hershey Park. Molly went to wait on line for the Comet - a wooden roller coaster that has always been my favorite - with Geri's oldest and her hubby, while Geri and I put the young'un on a couple of rides and talked. It was very cold, however, and the park was apparently sold out of cocoa. That's right.... you read that right, Hershey Park sold out of cocoa. Now I could see silo after silo filled with cocoa bean. Oh the irony of it all. The next day we did Central Market and visited with Sarah a little bit. So that's Geri on the end, Sarah in the middle, and me on the other end. It was a very pleasant visit. While we were talking, the boys were in the Kids Yoga room, testing all of the drums. Sarah's grand-daughter Ember was there, so a good time was had by all. Another project is a group quilt. I'm not going to discuss it too much because I don't want to give it away on the way off-off chance that the surprise-ee should wander by this way, but this is the square I came up with. It turned out pretty well except that I got carried away size wise, and the sides will both need to be turned under to stay in line with the other squares being sent in. Some day I will learn to follow the rules and color inside the lines. HAHAHAHA.... probably not. Anyway it was fun to get out the needle and thread. My favorite method is to draw as I go and then follow with the thread. For instance, this started with the butterfly. Then the sprig of blue lily of the valley type flowers, then the big pink, the sprinkling of blue and pink, then the baby sunflower at the bottom. Finally I just threw in some stem-age. In high school, I did a lot of that type of sewing. It's like doodling with a needle. My boyfriend at the time had the most impressively embroidered jeans jacket. I worked on it whenever it wasn't jacket wearing weather. He told me years later that it was stolen at knive-point while he was in Amsterdam. He told me a lot of weird stuff, though. Tomorrow is the PA Herb Festival in York. It actually starts today. Maureen at www.herbnet.com has a booth, but can't make it for both days. I'll be there tomorrow, and bring her stuff home. The weather is not good for an herb festival. Even though we are inside, the weatherman just keeps saying how there is no warm air in sight. I'll be interested to see how this goes. Coming to the forefront of my consciousness is the program in Baton Rouge in May. I need to ship the still in the next few days, and that is stressful. So much glass.... We also need to get the class put up on the list and nail down what the program will be about (other than just lemon balm) so we don't have to do all the planning on the plane. So - just in case you thought life at The Essential Herbal headquarters had gotten dull, nah. We were just using the space for something else. Salves and Balms Class - Online! We're giving another class, this one the last week of April. SALVES AND BALMS It is a basic class to help get the concept of combining oils and butters with beeswax to achieve different thicknesses. We'll discuss different ways of infusing oils with herbs - and you'll infuse oil with calendula, which will be used in all of the product recipes. There is a kit, which you can choose to purchase along with the class registration for $20 (plus shipping) - or if you have all of the ingredients we'll be using (or are familiar enough to swap things out on your own) you can just take the class for $7.50. Order and sign up HERE until April 9th. Kits will ship beginning the 10th and should be in homes by the the 20th. The class will be from April 23rd through the 29th. We will be making "Boo-boo Salve" , Gardeners Healing Salve, Chocomint Lip Balm, and a Bug Be-gone Lotion Bar. 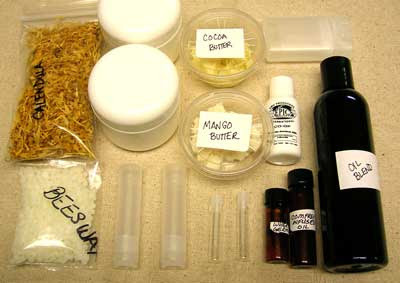 Ingredients of the kit are: Base oil blend which will be used in all projects (apricot kernal, avocado, and jojoba), comfrey infused oil, wheat germ oil, mango butter, cocoa butter, beeswax, emu oil, calendula petals, and essential oils (peppermint, lavender, eucalyptus, tea tree, citronella, geranium, and lemongrass). All containers needed will also be supplied. Although the ingredients won't be pre-measured, the amounts are small, and you will not have a lot left over. As we did with the incense class, we'll open a Yahoo classroom and post photos, recipes, and instructions. Then we'll be available during the week to talk about the process while you do it. The incense class was a huge success. Join us! It's going to be fun.